This morning’s scripture is a story from the book of Samuel. It is a story of how Samuel, the man and prophet, came to be. It is the story of Samuel’s mother Hannah, who was married to a husband who loved her dearly but couldn’t make up for the fact that Hannah was not getting pregnant. And Hannah desperately wanted a baby. Whether she wanted a baby because that’s how women’s worth was measured at that time, or to silence the taunts of her sister wife Peninnah, or simply because she longed for a child of her own to hold and love, Hannah is in deep grief. And so she goes to pour out her heart to God. Her prayer comes out as tears. She weeps bitterly. Hannah teaches us that it’s okay to weep in prayer. Eli rebukes her for what he seems to see as excessive emotion, which he translates into having had too much to drink. But Hannah stands up for herself and explains she has been pouring her soul out before God, speaking out of her anxiety and endless pain. Hannah’s actions show faithfulness even in the midst of hopelessness. Hannah shows us how to pray in the darkness. And today we need to know how to pray in the darkness. We need to know how to pray in the midst of hopelessness. We need to know how to pray when we are full of anxiety and fear. I read something yesterday that said “I held an atlas in my lap, ran my fingers across the whole world and whispered, “where does it hurt?” It answered, “Everywhere. Everywhere. Everywhere.” We need to know how to pray in the face of such pain. This probably isn’t the first time we have prayed in pain of course, whether it is our own person pain, or the pain of the world. And if we have paid any attention at all to terrorist attacks around the world we have been in prayer for Nigeria, Cameroon, Yemen, Kenya, Syria, Iraq, Turkey, Egypt, Lebanon, and of course France among many others. Not to mention cities and towns in our own country reeling from gun violence and injustice. Or areas around the world struggling with war and natural disasters. And like Hannah our prayers may come out as tears. Or maybe shock. Or after a time maybe resignation and apathy. But we bring it to God, even if we aren’t sure if it will do anything or mean anything. Because we feel so helpless. Because we want it to be better. Because somewhere in our hearts we think that God has the power to comfort us, to comfort others, to fix what seems unfixable, to take our pain and transform it into a force for good. Because we have not yet given up hope. Hannah had not yet given up hope. Although all signs pointed to her continued path of pain, she did not give up hope. We come here this morning because despite our pain, despite our frustration, despite our shock, despite our wanting to throw up our hands and give up on the world, we have not given up hope. And we want to do something, to say something. We want to somehow proclaim that hate will not win. That violence is not the answer. We want to say that love wins, that light will shine, that justice will roll down like water and all will have enough. By coming here today, you begin to proclaim that. You begin to proclaim that while you may feel powerless, you are not helpless. If we find a way to move forward together; If we find a way to see each person as God’s beloved child and can help others to see that too; If we can just continue to do the next right thing, the thing that shows love and models justice and helps others find peace, then we are living out that hope. This doesn’t mean that everything will suddenly be better, be fixed, because we prayed, or even because we acted. Yes, Hannah goes home after her prayer and lays down her grief. And she becomes pregnant. But if you look at the text it says that in due time Hannah conceives and has a son. In due time. Not immediately. In due time. On God’s timeline. If you have been praying over the grief in this world brought on recently by terror and war, a set of successful coordinated attacks on innocent people in multiple countries may leave you feeling true despair. Because it is all still a huge mess with no end in sight. Because refugees stream over the border in the thousands, trying to escape from a daily reality of terrorism. Because things seems to be getting worse, not better. But do not give up. Anne Lamont said that Wendell Berry told her in Advent, the darkest shortest days of winter, “It gets darker and darker and darker, and then Jesus is born.” It is dark now and may get darker still. But we will wait on an answer to our prayers. In due time. And when Hannah’s time does come to have a baby, she rejoices and prays. Her prayer, that I read to you this morning, should sound at least slightly familiar. In just a few shorts week as we enter into Advent, a young girl named Mary will find herself praying a very similar prayer, only we refer to it far more often as the Magnificat. For Hannah and for Mary this is a prayer of hope. God will win. God will set things right. Those who are hungry will be fed. Those who use weapons to hurt the weak will be brought down. The poor will be restored. God will rekindle burnt out lives with fresh hope. At times, quite frankly, the prayer is self serving. Of course we always want to think God is on our side. But above all we pray that God can bring peace, that God can right a world turned upside down, that God can find a way to love and redeem us all. For Hannah that redemption came in the form of a son. For us, we are still waiting. In due time seems all too long – for us, for our children, for the poor, for refugees, for those who are grieving, for the next place terror will strike. And we pray, with our tears, pouring our hearts out to God. What shall we do Lord? Once again, violence, blood, death. 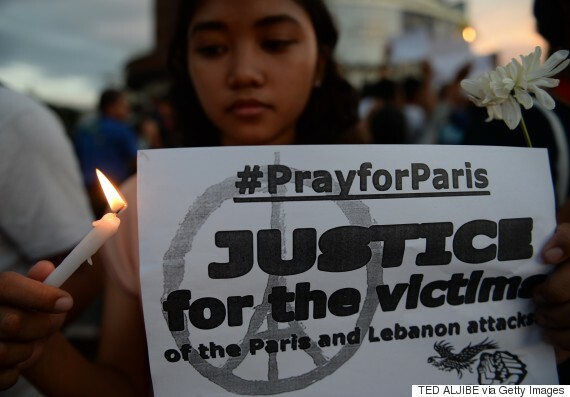 This time in Beirut, in Baghdad, in Paris. on behalf of the slaughtered and those who love them. and stir our weary souls to action. those who terrorize and kill. Make our congregations extremists in Your peace. beyond the bounds of moderation. in shockwaves not of desolation but of hope. That all the world can draw on it, as living water from a bottomless well. one of extreme consolation and even, one day, exceeding great joy. This is what we must do. This is our Prayer, our Magnificat. This is our way of saying God is good. This is how we proclaim that God is with those who mourn, those who are vulnerable, those who need help. We become extremists in peace. We heal. We love. We show unabashed compassion. We show up for one another time and time again, even when we are tired. We find ways to spread joy to one another and out into our communities. We create in the face of destruction. We make music. We welcome refugees. We fight for the powerless. We lift up and celebrate those who help: People in Paris who welcomed stranded strangers into their homes and gave blood despite terror; The father in Lebanon who threw himself on a suicide bomber, losing his life in the process, but saving the lives of countless others. We pray. We pray like those who have hope. We pray like Hannah. It isn’t easy for me to stand before you this morning because I don’t have all the answers as to why this happened, or what it all means, or how we can make sure it never happens again. In fact, it seems clear to me, that there will be other attacks and more grief and fear to come. And you will come once again to God and say, “Why God?” and “How long, O God?” And there will not be the immediate answers we all crave. But then I remember when I walk outside now, of the crunch of dead leaves below my feet. I remember that to those leaves and trees, this is a time of death, of heartbreak as once vibrant green living things turn literally to dust. It speaks to me of Jesus’ death and I despair. Until I remember, in the spring the leaves will grow once again. I remember that Jesus rose to say death cannot win. I remember Hannah’s story. And so though I may be afraid and overwhelmed by grief, I will not let that fear stop me from praying and living out that prayer by spreading love, hope, and peace. Won’t you join me? Amen. Thanks for the lovely and powerful sermon. I’m glad you found the prayer useful. Blessings on your ministry! Your prayer was beautiful and so powerful. It made a huge impact on me when I was writing the sermon and I just had to share it. Thank you for writing it. So glad you enjoyed the sermon.